Welcome to every child and many adults nightmare! 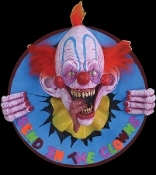 This three dimensional Creepy Carnival Killer Clown Wall Plaque prop decoration will have people jumping back in fright. This scary clown is ready to bust out of any wall or haunted house with spooky detailed sculpting and design. Offered with a picture hanger wire on the back for hanging ease. Perfect for a home haunt or simply your living room!! 23-inch diameter x 9-inch deep (57.5x22.5cm).